One piece of advice we give every employer – get yourself a well written and comprehensive employee handbook. 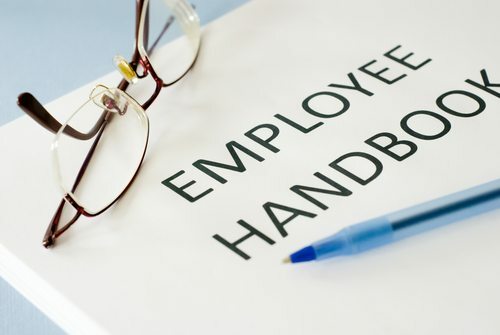 Why – because a good handbook lays out the rules of your workplace and protects both you and your employees. serve the right to change the handbook at any time. Here is where you want to cover all the basics such as dress codes, telephone use, holidays, pay periods, time sheets, and anything else that is pertinent to your business. Include all details covering appropriate use of electronic communications including emails, internet use and social media. And remember employees must be warned in advance if your company reserves the right to monitor employee computer systems. Here is where you want to make it absolutely, positively clear that your company will not tolerate harassment or discrimination of any kind. In addition, make it clear what steps an employee should take if they have a complaint. Having a very clear procedure in place is very important and may reduce your liability should an incident occur. Make sure to explain your policies on all form of leave your company permits, including vacations, family/medical leave, sick days, jury duty, personal leave and the like. If eligibility for leaves varies by employee type – clearly state that fact. Also, make sure you establish that employees must approve all vacations in advance. Finally, adding a provision that makes it clear that employees earn only a pro-rata share of the vacation time during each month may also be a good idea, protecting you from having to pay an entire year’s worth of vacation for an employee that departs early in any year. It is a good idea to highlight benefits provided. Full detail, though, should be reserved for the benefit plans themselves. Define employee misconduct and explain the consequences of any such actions, but do not lock yourself into a plan of action by using absolute statements. Clearly state your right to judge events on a case-by-case basis to determine appropriate behavior and do not limit misconduct to only what is included in your employee handbook or you could find yourself handcuffed in the event of an unforeseen employee act that seriously damages your company. Make procedures for handling employee work related grievances very clear. This will enhance the likelihood of a swift resolution to any problem. It is important to have a lawyer carefully review your handbook for problems that could have legal consequences in the future. A good attorney will also be aware of the ever-changing Federal and State laws and regulations that might impact your employee relations. Contact us, we are happy to help.